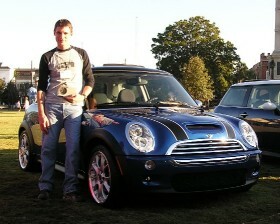 MINI Life in Charleston: How about a little BLING for your MINI??? I have some old 'S-Lites' you can chrome if you like ! !... Hey ... that wheel looks like an old S-Lite hmmmmm. I am looking to find someone who lives on the east coast, South Carolina area, who maybe can fill me in on that area. My wife and I are thinking of moving to the coastal area form California. I own a '04 MCS. My website is www.twistybitz.com.